featuring all women performers: Danza Azteca, Cihuatl Ce, Guerrilla Queenz, In Lak Ech, Las Ramonas, Raquel Salinas, and The Sirens. Limited Seating available 6:30 p.m. Parking is only on local streets at this time. (Mariachi Plaza stop is right in front of the 1st event). Primera Taza, East Side Luv and the Local First St. businesses & community organizations. Also thanks to our Comadre Circle CSULA Chican@ Studies professsor: Professora Dionne Espinoza, CSUN Professoras: Sirena Pelarollo (Spanish), Marta Lopez Garza (Womens’ Studies), Mary Pardo & Lara Medina (Chican@ Studies), Mujeres Activas En Letras Y Cambio Social de CSULA andMECHA de CSUN. 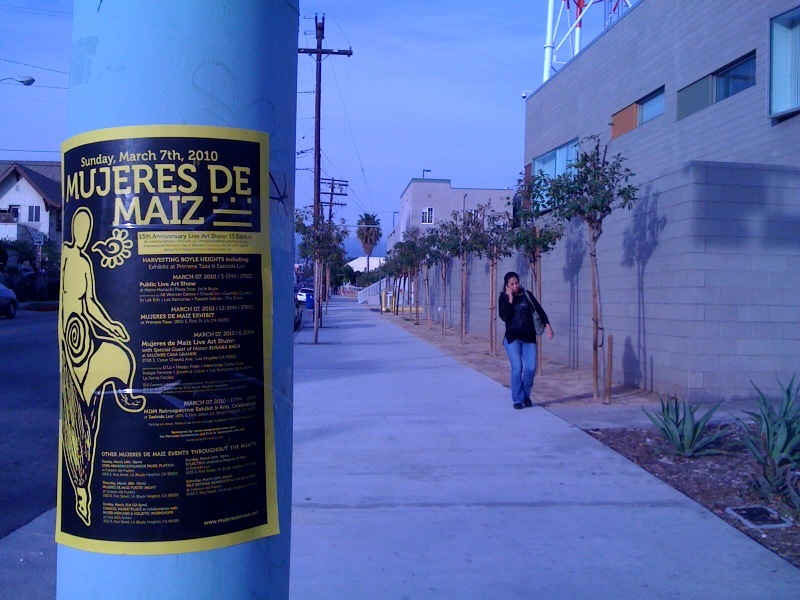 This entry was posted in art, culture, Eastside, Events, Gente, history and tagged boyle heights, Mujeres de Maiz by El Random Hero. Bookmark the permalink.